This article is about the Hindu goddess. For the Buddhist bodhisattva, see Tara (Buddhism). Tara in a form of Ugra-Tara (Violent Tara). Golden Tara, the Majapahit-era (13th–16th century CE) gold statue discovered in Philippines is currently at the collections of the Field Museum of Natural History in Chicago. In Hinduism and Buddhism, the goddess Tara (Sanskrit: तारा, tārā), is the second of the Dasa (ten) Mahavidyas or "Great Wisdom goddesses", and is a form of Shakti, the tantric manifestations of the goddess. The word 'Tara' is derived from the Sanskrit root 'tṛ', meaning to cross. In many other contemporary Indian languages, the word 'tara' also means star. The origin of the goddess Tara is documented in the tantric text Adbhuta Ramayana. According to a text named Adbhuta Ramayana, when Sita in the form of Kali slew Sahasraskandha Ravana, Brahma and other deities propitiated Her with hymns. Appeased, Devi assumed the calmer form of Tara. Holding Her sword with the right hand, Devi accepted the clothing of tiger skin from Brahma, removed her golden crown,piled Her hair into Jatamukuta and bound it with the serpent Akshobhya. Rudra laid on the ground and requested the boon of Brahmavidya from Her, to which Devi placed Her left foot on his chest and enlightened him. Hence, Rudra offered Her a blue lotus and a skull cup. A variant version speaks of Tara's demon-slaying form; a demon called Hayagriva wreaked havoc everywhere and banished Devas from Amaravati after defeating them and robbing them off their possessions. It is then that Devas approached Brahma,who lead them to Kali. The Supreme Goddess created another Devi from Her third eye,who was none other than Tara, and sent Her to defeat Hayagriva. In the battle that ensued,Tara prevailed and slew Hayagriva. A non-popular version from Kalika Purana associates Tara with Matangi (both considered forms of Durga). According to this, when the Devas were defeated by the demons Sumbha and Nisumbha, they sought refuge in Himalayas and began to propitiate Devi. At that time, sage Matanga's wife Matangi saw the Devas and asked whom are they propitiating. Before the Devas could answer, Devi Mahasaraswati manifested from Matangi's body and replied that the Devas were propitiating Her. Since Mahasaraswati manifested from Matangi's body, the fair complexioned eight-armed goddess came to be known as Kaushiki. On the other hand, Matangi's complexion turned dark and She came to be known as Kali and Ugratara. Another non-popular version is when the firm landmass on Earth was created using fragments of Madhu and Kaitabh's bodies, that did not cause the birth of life because there was nothing other than water and firm landmass on Earth. Hence, creation was still incomplete. After water and Earth, the Sun was required to provide life force. To create the same, Mahashakti had taken the form of Tara and Mahadev had taken the form of Lord Akshobhya. He and Goddess Tara were the reasons they had brought the sun into existence. Without the eternal sun, the Earth was just a mere orb covered in ice on which life could not have survived. That is why Devi Tara had appeared from whom the sun had to arise and supply light and energy to Earth. Tara has the capability to produce light, energy and heat. When the power met with the power of Akshobhya, their combined power became the source of the sun. When the combined powers of Lord Akshohya and Devi Tara got integrated in the sea, many pulsating energy orbs were created, in which it led to the expansion of energy. Goddess Tara created a tremendous air flow from her breath which hit the energy bodies and led to their union. Then the increasing source of energy inside the water started assuming the appearance of the eternal sun. Thus, the eternal sun appeared by the combined powers of Goddess Tara and Lord Akshobhya. Surya pays his thanks to Akshobhya and Taradevi for giving birth to him. Tara tells him that he has been born to give his life-giving sun rays to the world and give life to all beings. She requests Lord Surya to stay at his place and provide heat, light and life sustaining energy to the Earth. He will lead to the creation of day and night and will lead to the circle of seasons on Earth. She advises him to leave and carry out his duties of giving life to everyone. Lord Surya assured both that he will fulfill his purpose as given by them both to keep balance in the universe according to the laws of nature and not go against any law as he knows from the knowledge that they both have implanted inside him, which may put the universe in a catastrophe. Next, Tara had assumed the form of Goddess Shodashi to provide all forms of greenery and plants to the world. Devi Shodashi then placed a bamboo inside the earth and poured one drop of water from her waterpot, this gave birth to all plant life and then all forests, trees, plants and nature grew. Kali and Tara are similar in appearance. They both are described as standing upon a supine Shiva in an inert or corpse-like form. 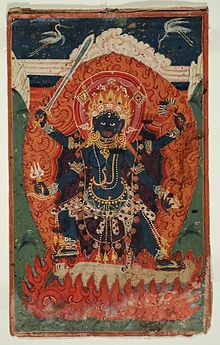 However, while Kali is described as black, Tara is described as blue. Both wear minimal clothing, however Tara wears a tiger-skin skirt, while Kali wears only a girdle of severed human arms. Both wear a garland of severed human heads. Both have a lolling tongue, and blood oozes from their mouths. Their appearances are so strikingly similar that it is easy to mistake one for the other.Tara is shown standing in Pratyalidha posture(in which the left foot is forward). Her Bhairava(consort) is Akshobhya,a Bodhisattva who is in the form of a cobra coiled around Tara's matted hair. She wears a crown made of skulls of five meditating Buddhas. Tara has eight forms called Ashta Tara and the names are Ekajata, Ugratara, Mahogra, Kameshwari, Chamunda, Nilasaraswati, Vajra, and Bhadrakali. Tara is said to be more approachable to the devotee (Bhakta) or Tantrika because of her maternal instincts. Like Kali, furthermore, Tara in her Hindu context enjoys blood. In her hymn of a hundred names from the Mundamala-tantra, she is called "She Who Likes Blood", "She Who Is Smeared with Blood" and "She Who Enjoys Blood Sacrifice". Tara can be distinguished visually from Kali primarily via her implements. Four armed, she carries a sacrificial sword, a severed head or skull cup, a blue lotus and a flaying knife. Kali never holds a lotus or a flaying knife. The murti at the Tara Ma mandir in the village of Tarapith, a highly important Tantric site for Bengali Shaktas (and highly contested as to whether or not it is truly a Shakti Pitha; scholarly evidence points towards yes), is mostly covered by Garlands of flowers. Some people believe that eyeball of sati fell here thus this pith is called tara pith because Bengali people named eyeball as chokher moni and another name of moni is chokher tara. There are two Tara images in the sanctum. The stone image of Tara depicted as a mother suckling Shiva – the "primordial image" (seen in the inset of the fierce form of the image of Tara) is camouflaged by a three feet metal image, that the devotee normally sees. It represents Tara in her fiery form with four arms, wearing a garland of skulls and a protruding tongue. Crowned with a silver crown and with flowing hair, the outer image wrapped in a sari and decked in marigold garlands with a silver umbrella over its head. The forehead of the metal image is adorned with red Sindur (vermilion). Most devotees will not have a chance to see the actual stone image, as there are only 15 or so minutes of Darshan or viewing of the stone at 4:30 am when the temple opens and only the first lucky few will be admitted into the adytum (the Garbhagriha) to see the stone. Goddess Tara, Bihar c. 9th century. Unlike most Indian villages and towns, the smashan or cremation ground is not situated on the periphery of the village. As cremation grounds are seen to be polluting, most Indian smashans are located far from the center of town. Both the Tarapith mandir and smashan are very close (within 100 yards or so) to the center of the town and near Dwarka River. It is said that Tara Ma's footprints are preserved in the smashan; this is a common theme in Hinduism, where deities or their especially holy followers are said to leave their footprints in rocks. Many Sadhus and Tantrikas live in the smashan, some with permanent huts as residences. The smashan is filled with dogs, traditionally polluting animals who were said to share food with the Vamamarga saint Bamakhepa, whose samādhi or tomb is located next door to the main Tarapith temple. Tara (Sanskrit: तारा) in Buddhism, is a female Bodhisattva in Mahayana Buddhism who appears as a female Buddha in Vajrayana Buddhism. She is known as the "mother of liberation", and represents the virtues of success in work and achievements. Some researchers believe Paranasabari is another name for Hindu Goddess Tara. ^ David Gordon White The Alchemical Body: Siddha Traditions in Medieval India, (Kindle Locations 1613–1615). University of Chicago Press. Kindle Edition. "This coastal location reminds us of what may have been Tārā’s original role: she was a goddess of navigation, of sea crossings— tārā is generated from the verb tṛ, to cross over the sea." ^ Reflections on the Tantras. S̄udhakar Chattopadhyaya. p. 76. ^ The social function of art by Radhakamal Mukerjee. Philosophical Library. 1954. p. 151. Banerjee, Sumanta (2002). Logic in a Popular Form: Essays on Popular Religion in Bengal. Seagull Books. ISBN 81-7046-162-6. Kinsley, David R. (1988). Hindu Goddesses:Visions of the Divine Feminine in the Hindu Religious Tradition. University of California Press. ISBN 0-520-06339-2. Kinsley, David R. (1997). Tantric Visions of the Divine Feminine: The Ten Mahāvidyās. New Delhi: Motilal Banarsidass. ISBN 978-0-520-20499-7. MacDaniel, June (2004). Offering Flowers, Feeding Skulls: Popular Goddess Worship in West Bengal. Oxford University Press. ISBN 0-19-516790-2. MacDaniel, June (1989). The Madness of the Saints: Ecstatic Religion in Bengal. University of Chicago Press. ISBN 0-226-55723-5. Shankaranarayanan, Sri (1972). The Ten Great Cosmic Powers. Dipti Publications. ISBN 81-85208-38-7. Svoboda, Robert E. Aghora: at the Left Hand of God. ISBN 0-914732-21-8. Svoboda, Robert E. Aghora II: Kundalini. ISBN 0-914732-31-5. Svoboda, Robert E. Aghora III: The Law of Karma. ISBN 0-914732-37-4. Wikimedia Commons has media related to Tara (mahavidya). This page was last edited on 5 April 2019, at 14:16 (UTC).